Established in 1981 Safety Surfaces (formerly Superlawn SEQ) has established itself as a reputable and reliable leader in outdoor and landscape surfacing. We provide a range of options for landscape surfacing from natural elements to Synthetic Grass and Wet Pour Rubber. Safety Surfaces is conveniently located to service all of South East Queensland and Northern New South Wales. 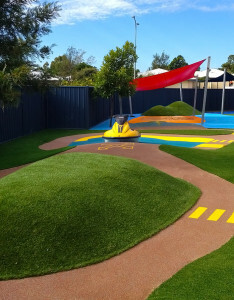 Safety Surfaces has specialises in the refurbishment and installation of Kindergarten and Early Learning Centre playgrounds and outdoor environments. Whilst we have a focus on the childcare field, we also provide services for commercial projects and clients including Councils, Schools, Resorts, Theme Parks and Special Events. Safety Surfaces is a proud Australian company and wherever possible we choose to supply and install Australian made products. In fact, the vast majority of our materials are manufactured right here in Australia, including all our Synthetic Grass and the majority of our rubber products. Safety Surfaces is a secure business with a solid track record, ensuring we’ll be here for the long haul. Safety Surfaces is QBCC licenced and fully insured for your peace of mind and protection. We can ensure that all our products and installations comply with applicable Australian Safety Standards.